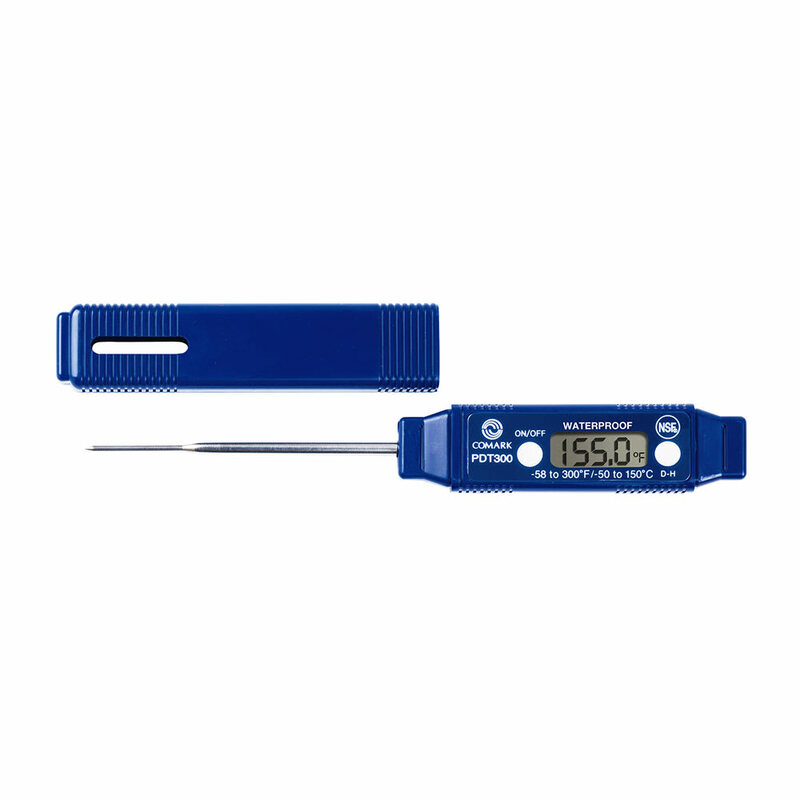 The Comark PDT300 pocket thermometer is waterproof, making it ideal for use in a busy commercial kitchen. The thermometer is digital, with an easy-to-read LCD screen and a response time of 6 seconds or less. 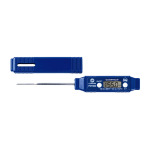 With a temperature range of -58 to 302 degrees Fahrenheit and accuracy within 2 degrees, this thermometer is suitable for a wide range of uses in a commercial kitchen. The stainless steel stem is 5 inches long, making it suitable for penetrating to the center of large cuts of meat, but the probe tip is only 1⁄16 inches in diameter, so it is also able to measure the temperature of thin items such as hamburger patties. The Comark PDT300 features a thin design and comes with a protective case, so it fits easily in a pocket and the tip is protected. The handle features BioCote®, an antimicrobial protection to help prevent cross-contamination, and the thermometer is NSF Certified and easy to clean. This thermometer runs on AB13 batteries and has an auto power-off to help conserve battery life. Waterproof Pocket Thermometer, digital, 3" stem, pen-type, temperature range -58 to 300 F (-50 to 150 C), field calibratable, BioCote anitmicrobial, data hold (D-H) button, NSF. "I need to change battery and compartment doesn't open. I've tried in different ways. FRUSTRATING"
"Bought this for my daughter to use. Display shows off indefinitely when off and drains battery in two days." "We have been using these for years. It seems the quality has declined in the past year. We have a high number of failures; probes coming out, p..."
"We have been using these for years. It seems the quality has declined in the past year. We have a high number of failures; probes coming out, poor battery life, total failures. Unfortunately the Comark PDT300 is what we have approved for our manufacturing facility and to change requires a "Process Change Request", submitted it triplicate,followed by weeks/months of testing to confirm a new process."